Be the first to share your favorite memory, photo or story of UMA. This memorial page is dedicated for family, friends and future generations to celebrate the life of their loved one. A beautiful, loving spirit returned to her Creator too soon. UMA chose me to be her person, becoming my Companion, my Guardian, and my Helper. She filled my life with love and joy and laughter for almost five years. UMA had many friends who will miss her and her loving ways. She loved being given the "FREE" command; then going to people who needed doggy hugs, sharing her loving, snuggly self with them. She loved visiting Fire Departments, Veterans facilities, Assisted Living facilities, charitable organizations, our neighbors, children, elderly, - wherever and whenever she could give hugs and snuggles and comfort. She was incredibly smart. She had a sense of humor! I learned much from her. UMA fought a short valiant battle with hemangiosarcoma - a rapidly growing, highly invasive, aggressive, malignant tumor of the blood vessel cells. A devastating diagnosis! A devastating disease! A devastating, heart-breaking loss. 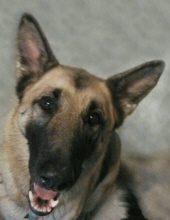 UMA was a wonderful Mobility and Balance German Shepherd Dog with Cardiac Alert skill as bonus! She saved my life twice by alerting me to silent, life threatening MIs. True to the best of her breed, UMA lived to love, to serve, and to protect her person! UMA, Honey, I will love you, miss you, remember you, and cherish our too short shared life together the rest of my days. To send flowers or a remembrance gift to the family of UMA Benfer, please visit our Tribute Store. "Email Address" would like to share the life celebration of UMA Benfer. Click on the "link" to go to share a favorite memory or leave a condolence message for the family.